I like the mocha flavor and coffee too. When i seeing recipes using instant coffee powder in baking , i thought how it will taste. 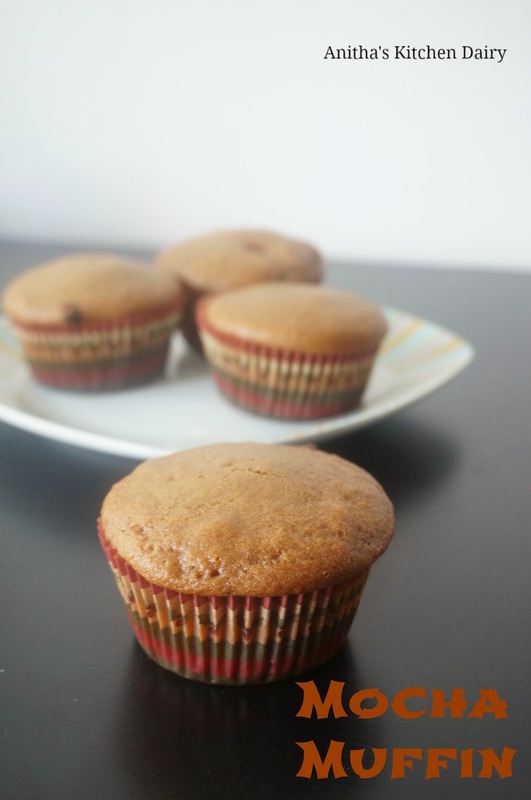 When i tasted the muffin it really good to taste a coffee flavor with the chocolate.Two favorite flavors in one muffin..This muffins is are perfect for any time of day. Preheat oven to 360F . Grease and line muffin pan and keep aside. In a mixing bowl , add whole wheat flour , All purpose flour , coco powder and salt whisk well. In a separate bowl , mix sugar and all wet ingredients. Now add instant coffee powder (I used Nescafe) and mix well. Now add dry ingredients to wet ingredients at 3 batches . Scoop the batter into lined muffin tray and bake it for 15 -20 minutes.